I love that squiggly feeling you get in your stomach when you’re reading or watching a romantic comedy. A part of you is rooting for the characters to get together, but you’re also worried they might not be able to work out their differences. That’s what reading A Little Something Different felt like; nervous squigglies and desperate hope. 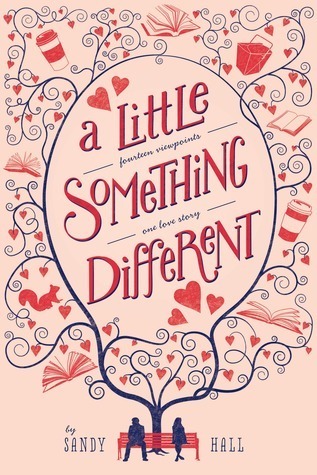 A Little Something Different follows the budding relationship between Gabe and Lea, who everyone knows should get together but for some reason haven’t yet. It tells the story from the perspective of fourteen different people. The Delivery Guy, their creative writing teacher, the bus driver, everyone knows Lea and Gabe are perfect for each other and we get to see an entire community shipping them. It was a lot of fun to read about! Hall did a fabulous job giving every viewpoint a unique and different voice. Lea’s best friend read nothing like the bench on campus (thank goodness). These shifting viewpoints made the story a very quick read. You’re always excited to see what is going to happen in the relationship next and it was nice to have that sense of urgency in a book that occurs over the course of a year. Overall, A Little Something Different was a perfect romantic. It gave my heart the flutters and put a smile on my face. Definitely add this to your summer before college, or beach read, pile! Adorable review! I don't always go for this type of book but you make me want to check this out. I need this book in my life, like NOW! I have been dying to read it. Great review! I’m a HUGE fan of rom-coms so I’ll definitely be picking this one up! Glad you enjoyed it :D Great review! This book was adorable. I loved how each POV was very distinct. This story was definitely different, but highly addictive and very easy to read.